The art of community living starts with the 12.5 Condos, which are 13 townhome-style units designed by Holst Architecture and erected by the Portland home builders at H. Hudson Homes a few years back. All sold now, these new homes brought a fresh splash of modern design to their northeast Portland neighborhood when they were built, with a crisp, white stucco exterior, wood-accented exterior wall surrounding the second floor and generously tall windows. An aura of comfort and excellence is evident throughout the townhomes, which start at 1,200 square feet. The u-shaped building faces the street to the west and has a common drive separating the two wings of the townhomes. The dark, wood-lined walls that face the common drive offer a dramatic visual contrast to the white stucco exterior walls and the concrete below. To the east of the complex, you’ll find a private garden. The interior space offers a wall-to-wall kitchen on the second floor with countertops that are just as long. Equally as gratifying are the number of windows that you’ll find throughout each unit and the private garages. 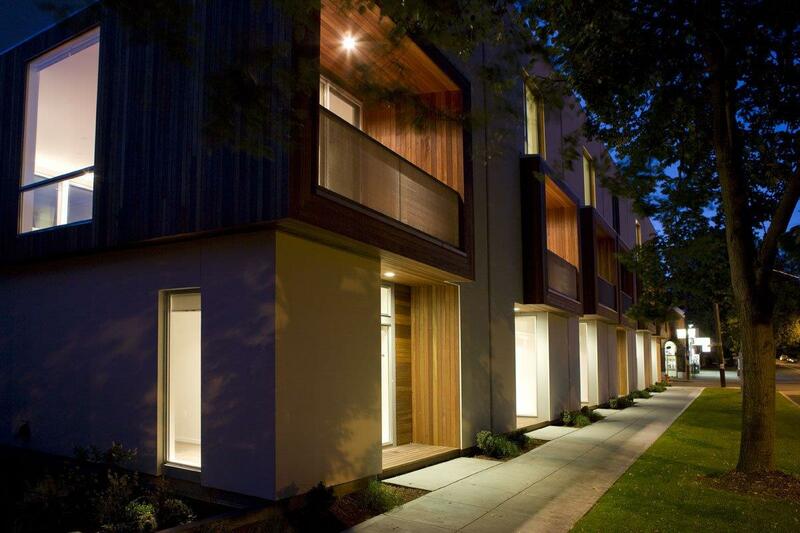 Portland home builders constructed the 12.5 Condos with the environment in mind. In addition to using high quality, eco-friendly materials, the builders of the new homes in Portland, Oregon installed Energy Star-certified appliances (like the 92 percent efficient HVAC system with insulated ducting) and other amenities that add to comforts of the living spaces.